On August 27, 2003, Jenny was 25 years old. She was also very pregnant and swollen. After a checkup, Jenny’s OBGyn sent her to the hospital to induce labor. After 27 hours in labor, Jenny’s daughter’s heart rate suddenly dropped drastically, and she was delivered via an emergency c-section. Thankfully, she was big and beautiful and healthy. Everything seemed okay with Jenny as well. This was Jenny’s first baby and she did not know how one was supposed to feel. She was very weak and did not feel like getting out of bed. As family and friends came to visit, they noticed that Jenny’s swelling was not going down. They noticed that Jenny was not quite herself either. Jenny thought that she was fine at the time, but everything and everyone seemed very blurry in her mind. When Jenny went to bed on August 30, 2003, she was not feeling very well at all. Jenny was having trouble breathing, so she called the nurse, who told her that it was normal to feel pressure in your lungs, that all women feel that way when they take Percocet. She gave Jenny some medication and told her to get some rest because she was going home in the morning. But at about 4:00 AM, Jenny awoke, barely able to breathe. She felt like she was hyperventilating. Jenny’s husband ran to get help and a doctor rushed in the room and started barking orders. They thought it was pulmonary embolism, and Jenny was rushed to the MRI machine. They kept telling Jenny not to breathe, it was messing up the MRI image! Apparently, Jenny passed out in the MRI machine. The next thing Jenny remembers is being rushed to ICU and having her blood gases taken; Jenny whispered, “Am I going to die?” When she saw her husband’s face, she really thought the answer was yes. Jenny was intubated. In the ICU, Jenny realized that she could not move anything, could not open her eyes. Though she was in a medically induced coma, she could hear and feel everyone around her. The doctors called Jenny’s family in, and told them to call her loved ones to come to the hospital to say good-bye. Jenny’s husband was told that she had, at best, a 40 percent chance of survival if she survived the first couple of days. He was told that Jenny had ARDS, most likely initiated from sepsis or an amniotic fluid embolism. She had been functioning on less than 25% of one lung. In the ICU, everyone visited Jenny. They spoke as though she were already dead. Jenny sensed the hopelessness in their voices, and it upset her. But each visitor would also tell Jenny that they had gone to see the baby and she was beautiful. And every time Jenny heard that, she would cry. Tears would roll down her cheeks, and her heart rate would go crazy. Because Jenny got so upset, visitors were limited. Jenny thought only about her little girl. She was upset that she could not see her or hold her, that her husband had to take her home from the hospital without Jenny. She had resigned herself to the fact that if she died it was okay because at least Jenny got to spend a couple of days with her. That was the most upsetting part for Jenny, who only wanted to be her mother, and more than just for a few days. Fortunately, Jenny’s friend was the ICU’s head nurse; he got Jenny one of the “special” beds-that prevent bedsores-fans in her room and allowed Jenny’s husband sneak in and spend the night sometimes. What was most annoying was that the nurses would tell Jenny’s visitors, ‘she is resting, she can’t hear a thing.’ But Jenny could hear. She hated that they kept putting VH1 on when she just wanted the news on. And when the nurse would come in, draw the curtains, dim the lights, Jenny knew someone was leaving the ICU, not to return. Jenny did not want to leave that way. Jenny did not know what was wrong and no one would talk about it around her. She did not know what was going to happen, or if she was getting better or worse. After seven days on the vent, Jenny gradually got better. She can out of the coma in the morning, on September 5, 2003. That same day, they extubated her, removed her feeding tube, central line. She was moved out of ICU that evening. On September 7th, Jenny’s husband was able to bring her daughter back to the hospital to visit. It was so wonderful for her to see her and touch her again! The next day, Jenny’s husband’s birthday, the nurse said she would go to the cafeteria to get her real food. Jenny said she wanted a cheeseburger and french fries. Her OBGyn was in the room and said, “You feel like eating that? REALLY?” Jenny said, “Yes, I am STARVING-this liquid diet doesn’t really cut it.” He told Jenny that if she could eat a cheeseburger, she was ready to go home. And that night, she did. 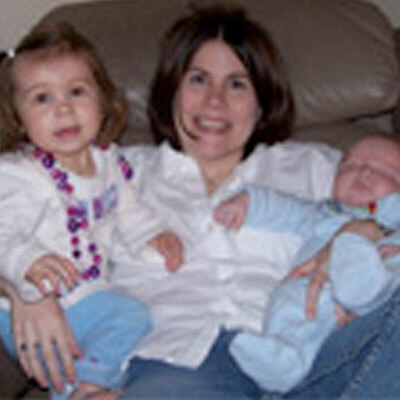 Jenny’s husband brought their daughter to the hospital and the three went home together. Of course, Jenny was very weak, and it took several weeks for her to heal so she could care for both herself and daughter, Lucy. Since ARDS, Jenny has short term memory issues, difficulty concentrating, and her cognitive skills are only a fraction of what they once were. Initially, she had hair loss, but it has since regrown. But these issues are only a small price to pay for a beautiful daughter, now two, and son, Chase, born in October, 2004. Thankfully, his birth was not as eventful as his sister’s was! Jenny is now living the life she dreamed about during those days in ICU, and she loves every day as a mother.